HCL Technologies has spent $1.1 billion to acquire a bunch of intellectual properties from heavyweights such as IBM and DXC Technology Co. This, HCL claims, will future-proof its business. Will the gamble pay off? Bengaluru: To the casual eye, it will appear HCL Technologies Ltd has been doing all the right things while making all the right noises about transforming its business amid a disruptive technological landscape. For the discerning analysts, India’s fourth largest software company could be riding a tiger. “It’s okay to invest in legacy technologies as part of a company’s overall investment portfolio—but it’s not the future. Smart companies harvest cash flow from established legacy offerings while simultaneously investing assertively in the future," said Robert C. Wolcott, professor of innovation at Northwestern University’s Kellogg School of Management. “Too much legacy means a long slide to oblivion, especially in technology markets." The issue with the investments being made by HCL as part of its IP licensing deals is that it appears the company is looking to play more a role at the bottom, said two company executives on the condition of anonymity. Since IBM first allowed HCL engineers to work on its products about 15 months ago, the US company has received close to $1 billion in payments, or about 90% of HCL’s total investment. While the benefit to IBM is manifest, the financial rewards accruing to HCL has been rather slow to come. HCL has, however, gone ahead and inked a total of 10 such IP partnerships (see chart), across technology domains such as core banking platform and a few automation platforms. The company expects to generate as much as $255 million in revenue in the first year from the date of stitching each of these IP partnerships. While this may prove financially lucrative in the short term, analysts doubt whether the cash flows will be sustainable, given their declining usage worldwide. “From a service provider perspective, these deals convert balance sheet into P&L (profit and loss) contributing to revenue growth, margin accretion and possibly even EPS (earnings per share) accretion in the first year," Kotak Institutional Equities analysts Kawaljeet Saluja and Jaykumar Doshi wrote in a 1 January note. “However, we believe these deals bring little in terms of strategic benefit for the service provider either in terms of client access or building out new IP competency." HCL’s investments in legacy technology areas is strikingly different from the ones followed by bigger rivals Tata Consultancy Services Ltd and Infosys Ltd, which are aggressively investing in cutting-edge technologies such as blockchain and artificial intelligence platforms. In another such partnership, HCL has invested $50 million in IP owned by DXC Technology Co. to develop its core banking platform Hogan, whose roots date back to 1970s. MintAsia’s reporting since the start of the year, based on interactions with half a dozen company executives and former employees, HCL’s balance sheets and quarterly post-earnings transcripts over the past six years, finds that HCL Technologies’s transformation story has some glaring holes, contrary to the management’s narrative of making the company future-ready. Another sore point with investors is the firm’s approach of recognising amortization and depreciation costs based on the revenue it generates, rather than accounting these costs at a fixed rate over time. One analyst estimates that the company is not generating enough business from these IP assets, and for this reason, HCL Technologies could possibly have to write down the value of some of these assets in the future. The accounting norm boosts the company’s profitability in the near term, analysts say. Although MintAsia could not independently establish the impact on profitability, as the IP partnerships have been signed over seven quarters, some analysts have noted that the company is pushing back its expenses to the latter part of the life of the contract. “A significant portion of amortization has been scheduled beyond FY22," Madhu Babu, an analyst at domestic brokerage firm Prabhudas Lilladher Ltd, wrote in a 25 October note to clients. See Table. In August 2016, HCL Technologies first disclosed that the company had decided to spend $40 million on an IP licence arrangement with IBM. Subsequently, the company promised to spend $1.1 billion in similar IP partnerships with three companies, including IBM, DXC and an unnamed US-based company. Under each of these IP partnerships, HCL made an upfront payment, with the remaining amount to be paid over a period of time. These IP partnerships, claims the management, will help HCL Technologies build solutions or customize the core IP technology, and then jointly sell along with the IP-owner of the technology the new solution. What has gone unnoticed is that these investments in buying IP rights, many of which are mature technologies, may weigh on the company’s balance sheet. Goodwill and intangibles, which are essentially a premium a company pays in lieu of a brand or unique technology when buying an asset or a firm, now total about 32% or $2.25 billion of HCL Technologies’ $7.24 billion in total assets at the end of December 2017, the highest among its peers. A detailed questionnaire, seeking comment, sent to HCL Technologies on 31 January, and repeated follow-ups, were unanswered. Sceptics say that HCL Technologies is merely buying revenue in the near term by getting assured business tied to these products. “A lot of large enterprises still use Lotus Notes and many of the regional banks in the US run on Hogan core banking platform. This brings good money for any company which can offer these clients that they have expertise to help them maintain these platforms," said a former executive at HCL Technologies, who was earlier involved in one of the IP partnerships with DXC. “However, no new company wants to get Lotus Notes. No top-tier bank wants to have Hogan core banking platform either. So where is the business model?" Over the past few years, India’s $154 billion IT outsourcing sector has seen revenue growth slow even as it has taken a hit on profitability. This is because the companies aren’t able to charge higher prices because of intense competition. At the same time, companies, across industries want their technology vendors to offer solutions which use data analytics, artificial intelligence and automation platforms. This has forced companies, including Tata Consultancy Services Ltd, Infosys Ltd and Wipro Ltd, to either build technology platforms or buy some of these technologies. From investing in their own IP platforms to partnering with start-ups, each of these companies are battling hard to stave off this existential threat posed by the newer technologies to the traditional model of deploying armies of engineers to complete a project. HCL Technologies, long known for its dominance in maintaining computers and data centres (or infrastructure management services), has seen growth decline from its core business over the past two years. To be sure, slow revenue growth in its core business is the primary reason behind the company looking to move away from a people-led model to a company focused on offering solutions using IP platforms. Beginning October-December period of 2012 and until April-June of 2015, the management claimed to have won over $11 billion worth of new deals, across 11 straight quarters. Still, HCL Technologies’ incremental revenue during this time was only $1.8 billion. Since these deal wins were not translating into enough incremental revenue growth, Mint in a story dated 2 October 2015 found that one possible reason behind this dichotomy in new deal wins and growth was the company losing existing clients. Incidentally, HCL Technologies stopped quantifying its large deal wins from October-December of 2015. Mint, in another story dated 1 July 2016, reported that HCL’s old infrastructure maintenance contracts were getting squeezed as clients shifted to cloud computing offered by Microsoft Azure and Amazon’s AWS. Up until end of 2017, the management repeatedly tried to assure investors that much of the threat from cloud computing was exaggerated. Only in January, in a post-earnings interaction with analysts, the management acknowledged the impact of cloud adoption on its business. “About half of the business is data centre. So, it has definitely certain headwinds from a revenue perspective driven by cloud adoption," president and chief executive C. Vijayakumar told analysts on 19 January. Vijayakumar, who was heading the infrastructure portfolio of business before taking over as CEO from Anant Gupta in October 2016, first articulated the firm’s new strategy, of ‘Mode 1, Mode 2 and Mode 3’ approach, the same day he took over as the boss. On 21 October, Vijayakumar, while briefing analysts, shared that all of its traditional businesses such as application services, infrastructure maintenance and back office support will be clubbed under Mode 1. Digital, the fuzzy word that each IT outsourcing company chooses to describe uniquely, will be clubbed under Mode 2, while Mode 3 will comprise its products and platforms business, including IP partnerships. “And Mode 3 is really future-proofing our existing business which is the products and platform business," Vijaykumar told analysts. “Here, we are driving innovative IP partnerships through strategic relationships. 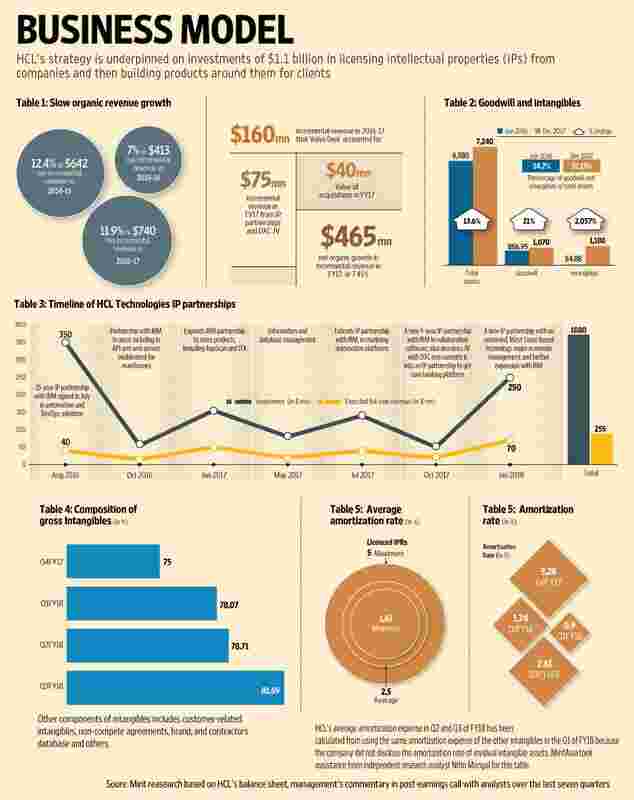 And this is primarily in creating market permissions for products and platform business." So why are some analysts and executives sceptical of HCL’s approach of generating revenue from licensing IP deals? Firstly, HCL Technologies is recognizing amortization expenses as per the revenue it gets. Put simply, a higher percentage of amortization expense booked in a quarter implies the company generated more revenue from its IP partnership in a quarter. 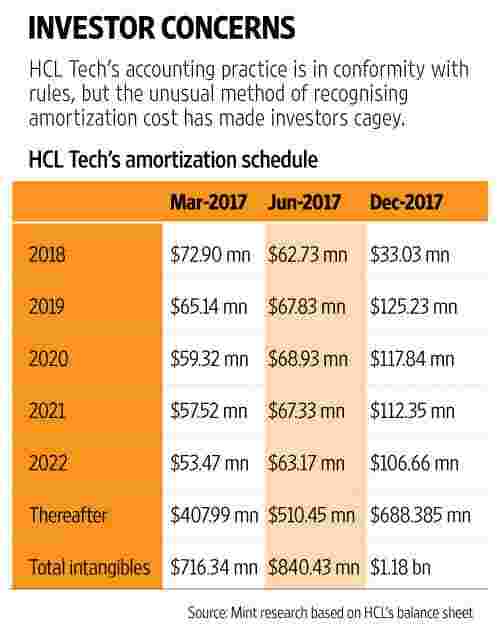 Although HCL Technologies’ accounting practice is in conformity with rules, the unusual method of recognising amortization cost, based on revenue generation from each of these IP partnerships, has made investors cagey. HCL expects to amortize a minimum of 1.67% of its IP assets and a maximum of 5% of licensed IPRs in any given quarter, according to management’s disclosure of life of these assets, as disclosed in the latest third quarter results. However, since HCL Technologies is estimated to have booked only 0.9% of its IP assets as amortization charge in the July-September period, which was less than the minimum value of 1.67% of IP assets to be amortized, this implies that the company got less revenue than it had anticipated from its IP partnership in the second quarter. For this reason, Mangal estimates that HCL Technologies could possibly write down the value of some of these assets it has accumulated. A write-down could make investors jumpy on account of the higher percentage of intangibles and goodwill. Nearly one-third of the company’s total assets are now in the form of goodwill and intangibles. Importantly, most of this increase has happened swiftly—18 months—and is the highest among its rivals. Since TCS, Infosys and Wipro have not made many acquisitions in the past year, the percentage of these intangibles to total assets is significantly less. Accenture Plc, which in the last year alone spent $1.7 billion in acquiring companies, and has made the highest number of acquisitions over the past three years, now has one-fourth of $23 billion of total assets in the form of goodwill and intangibles, at the end of November 2017. Accenture follows the September-August financial year. Some analysts and executives want the management to share more details about investments in some of the technologies. One technology area in which HCL has inked a partnership is IBM Lotus Notes. IBM has stopped sharing the growth or revenue from Lotus Notes, but it is widely accepted that the legacy software is fast losing share to Google and Microsoft. Some such as Ray Wang, founder and CEO of Constellation Research, believe that an over $500 million size of Lotus Notes software suite in Europe makes it a good decision to invest in this enterprise software. “This, if true, could make it financially prudent investment; but then, it does not help HCL Technologies when it classifies revenue from Lotus Notes as part of Mode 3 or what the management calls future-proofing its business," said one of the two HCL Technologies cited initially, requesting anonymity. HCL’s management has not yet given details of its investments in other IP areas across automation tools and database management areas. “I cannot answer why our company (HCL) will invest in some of the technologies you have mentioned. But if this is true that IBM itself has said these technologies are not the focus areas for itself, then sure it raises a few questions," said the executive. IBM’s stated intent behind these IP partnerships is best understood from what Martin Schroeter, senior vice-president, IBM Global Markets, said in a post-earnings call with analysts on 18 April last year: “…(We) are forming IP partnerships to enable ongoing innovation in our IP, while allocating our development resources to where we see the best opportunities for us." Although an email to IBM on 31 January went unanswered, it is clear that the company is slowly moving away from legacy software into areas of cognitive platforms and blockchain. HCL Technologies appears to be trying to squeeze the last dollar available from its existing clients rather than investing in technologies which are fundamentally changing the way business has been done in the past. “But don’t dismiss it just because it is legacy technology. There are not many companies in this space and you can always generate enough business if done well," said the HCL executive cited above. Doing it well is something which HCL Technologies has not done, at least with regards to one IP partnership. In 2015, HCL and Computer Sciences Corp. (which later merged with Hewlett-Packard’s enterprise-services division to former DXC last year) formed two joint ventures, incorporated in the UK: CeleritiFinTech Ltd (CFT) and CeleritiFinTech Services Ltd (CFTS). HCL set up a centre of excellence in Chennai, and put 300 of its employees to work across these two joint ventures. The rationale for setting up the joint ventures was to make the two companies, CSC and HCL, work together on the Hogan core banking platform, a product owned by CSC. Still, lack of investments from HCL and the inability to sell the core banking platform, prompted them to dissolve the JVs in September last year, according to three HCL executives familiar with the development. Surprisingly, in October, HCL again promised to spend $50 million in what it called was a new IP partnership with DXC. For the year ended March 2017, CFT reported $58 million in revenue, and a loss of about $40,000. This was less than the over $100 million revenue generated by Hogan in 2011. “Taking all of that into consideration, it seems to me that this is just a grab bag of weak products and sunset technologies," said Kannan Ramaswamy, William D. Hacker, chair professor of management at US-based Thunderbird School of Global Management. “Unless HCL is able to build a new ecosystem using this grab bag of technologies to mount a credible attack against some of the relatively cheaper enterprise apps coming from developers such as Google and Microsoft, I do not see any quantum leap in value for HCL."